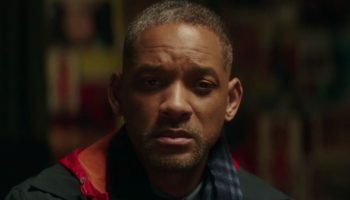 The Aftermath Review – Spotlight Report "The Best Entertainment Website in Oz"
Thanks to 20th Century Fox Australia for the chance to see ‘The Aftermath’ before its national release. This is our review of the movie, but as usual, no matter what we say, we still recommend you to go and see it at your local cinema because there is no better critic than yourself! The Aftermath stars Keira Knightley, Alexander Skarsgard and Jason Clarke. 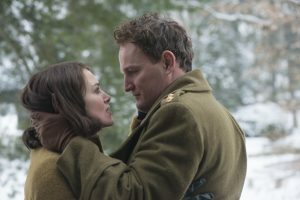 Set in 1946 post war Germany, Rachael (Keira Knightley) arrives in Hamburg to be reunited with her husband Lewis (Jason Clarke) a British Officer. After arriving to their new home, Rachel is surprised to discover that the previous owners, a German widower Stefan (Alexander Skarsgard) and his daughter will also be living in the house until they are sent away.Rachel forms a friendship with Stefan and this is where things begin to unravel. Rachel is torn between feelings of grief and passion. The film’s love triangle, set against the epic backdrop of war torn Hamburg, reveals the film is very much a melodrama – albeit a highly enjoyable one! Rachel, Lewis and Stefan are all struggling with their own individual conflicts. All three actors succeed in adding layers of depth to their character. Knightley oozes elegance and style. Her controlled yet expressive demeanour is perfect for the film. 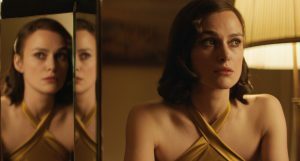 The director chooses to shoot close ups of Knightley’s face to capture her reactions that highlight her inner turmoil. It is easy to see why Knightley so often appears in period piece films. Unfortunately, the film puts too much focus on the love triangle between the characters and gets bogged down by the melodramatic plot points. The love story comes across as trivial in comparison to the lives of civilians living in the ruins of Hamburg. The Aftermath doesn’t take any steps to transcend the source material. The Aftermath follows many beats of a 1940s film. It has a dramatic love story and a climactic final act, which is perfect for fans of the epic war torn, love story drama. For people willing to suspend their disbelief and look past some predictable plot points, the film makes for a satisfying viewing experience. Knightley and Skarsgard have a believable chemistry and make for a good looking onscreen couple. Although not without its problems, the film’s experienced actors elevate a clichéd plot.